My garden is finally producing lots and lots of tomatoes and I’ve been feverishly trying to meet the supply with clever ways to incorporate tomatoes into my meals. Nothing highlights fresh, beautiful garden tomatoes better than a tomato salsa. There are traditionally two types of tomato-based salsas: Roasted and Fresh, each with their own pros and cons. Roasted salsas have great depth of flavor and a delicious smoky quality, but many of the flavors of the fresh tomatoes are lost in the cooking process. On the other hand, when fresh salsa is made with perfect seasonal tomatoes, nothing beats its bright and intense flavors although it still lacks some of the background flavors of its roasted cousin. 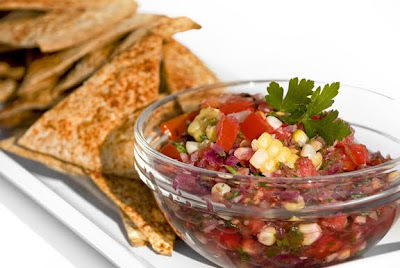 I wanted to incorporate the best of both worlds into the perfect salsa! my baked whole-wheat tortilla chips. They’re great warm out of the oven but are still crisp and delicious when made a day in advance and stored in an airtight container or plastic bag. Remove the seeds from each tomato and finely chop. Place the tomatoes in a strainer and allow them to drain for at least 20 minutes. Cut off a slice from the opposite side of the root end of the garlic, exposing all of the cloves. 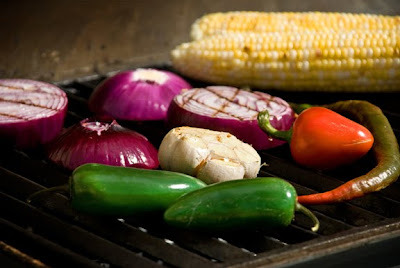 Over medium-high heat, grill the garlic, red onion, corn and chili peppers until they begin to brown and soften. Remove from heat and allow to cool. Using pairing knife remove the stem and seeds from the chili peppers and extract 6 of the garlic cloves from the skin. In a food processor combine the peppers, 6 garlic cloves, the red onion, and the parsley. Pulse until finely chopped. Carefully cut off the kernels from the corn from the cob. In a medium bowl combine the tomatoes, finely chopped vegetables, corn kernels, lime juice, salt, and black pepper. Mix well and taste for additional salt if necessary. Preheat oven to 500 degrees. Line 2 baking sheets with parchment paper. Using a pastry brush, brush each tortilla with water until slightly moistened. Sprinkle with chili powder and salt. Cut each tortilla into 8 triangles. Arrange the triangles in a single layer on the parchment lined baking sheets. Bake for approx. 5 minutes watching them closely to make sure they don’t burn. Remove them from the oven when they are just stiff and slightly browned. Be careful because just a few seconds to many in the oven and the result will be burnt and bitter tortillas. We are also experiencing a deluge of tomatoes and just this past weekend made a huge batch of salsa. However, I love your idea! My husband really takes a special pride in his salsa, so I will pass this version on to him (he also lurves his grill) and I think soon we will be joining you in enjoying the best of both worlds. Thanks! This looks so good! I can't wait to try this recipe. Nice job.